In late 2014, Chris Green published Online Arbitrage: Sourcing Secrets for Buying Products Online to Resell for BIG PROFITS in Paperback. The price tends to fluctuate between $99 and $299. (Or pay far less for the Kindle version). Yes, I bought my copy. At first, I was very skeptical of its value. But I had to see. It's a whopping 480 pages - or 3 lbs in paperback version! I read it all. My verdict? To my surprise, it's actually worth more that its price. See, if you're still looking for and buying items online (to flip on Amazon) using the same methods you were years ago, well, the game has changed. Today you have to be a lot more savvy if you want to snap up the best deals at the maximum savings and get maximum profits when you resell. Online Arbitrage teaches you everything, concisely, so you can do just that. It's a safe bet that most of your competition (other sellers who conduct online arbitrage) don't know or just won't bother using those tactics. ..That leaves you with the greatest chance of earning maximum profits and minimizing your risk (investment) with what you're buying online. If you're skeptical at how well Online Arbitrage works today, see the latest reader reviews here. And below is a list of the table of contents, so you'll know what is covered. Chapter 2: Buying Online – Where to Start? What's your opinion of Online Arbitrage? Post your comments below. hi jordan. for the past months i’ve been looking into starting an OA business but the countless youtube videos and courses that are out there can be overwhelming. i decided let me start all over and i recall hearing about you, so i’m taking a chance here to get your honest opinion. who or what course can i pursue that will get me on the right track starting my own OA business. i really want to do this, thank you. First, do you know the basics about selling on Amazon? If not, I recommend this free 7-day email course by my trusted partner The Selling Family (Jessica Larrew). After you’re set up to be an Amazon seller, I recommend the above book or this inexpensive course (the author of the Book above is one of the contributors). 1. You said buying inventory online accounts for 15% of your revenue. Do you also do in-store purchases? 2. I would like coaching on in-store purchasing arbitrage while I get the online arbitrage going. Do you offer a course or coaching? Hi Ed. That original post was from a few years ago. I’d say online inventory (“online arbitrage:) today counts for 20% of my Amazon store revenue. The remaining 80% is split roughly equally among retail store inventory (“retail arbitrage”), private label products, and wholesale. Re: coaching, I don’t offer one-on-one coaching. For that I recommend Jim Cockrum Coaching or Robyn Johnson coaching but if you’re pinched for time I do recommend the ProvenQ4 Group (also provided by Jim Cockrum, but closing soon) which will tell you *exactly* what to buy (in stores and online) to flip on Amazon/eBay this christmas. If you don’t have any experience selling on Amazon, here is a great free 7-day email course from another one of my trusted partners, The Selling Family. Good luck and Keep me posted Ed! Hi Jordan, Can you guide me regarding managing the profit/loss and finances. Just sent my first FBA, so want to figure out the best and easiest way to calculate the actual profit after deducting all the expenses etc. What would be the best approach. Can you please guide me to something. Do i have to do everything manually in excel ? Or can i download reports from amazon and do come number crunching on it via excel. Would be too early to go for any monthly accounting services. I bought your sellers summary of Chris’ book and now bought the full color version of online arbitrage. I think this will be great and plan to put my own spin on things. Question: perhaps I misunderstood something. I read that the kindle version is free but now that I bought the book and am looking around like a mad man to get the kindle version into the kindle reader app for iPhone, I am seeing there is a cost. If I’m correct, it wants me to have kindle unlimited for $9.99 per month and have an actual kindle reader to view this free copy of the book ( I don’t have either of these ). Is this correct? Hi Karen, content-wise the black and white version is the same as the color. With the color one, you get a free phone consultation with Chris Green. As far as the book itself, if you’re on a tight budget the black and white one is fine. Also, I want to tell you that your podcasts are very informative, and I appreciate what you do! I, like Steve would also like to know if it is possible to do online arbitrage from home without having to do retail arbitrage and still be profitable… I want to avoid going store to store as well. Yes, it can be very profitable. Buying inventory online (from home) accounts for at least 15% of my revenue today. 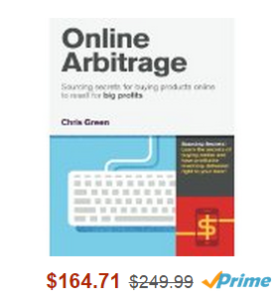 Chris Green’s book will help you master Online Arbitrage. do you know if this is available in the library? I do not have a kindle nor $200 to purchase this but I am very interested in reading it. any suggestions? You can always request your local library to get a copy. without giving it all away, does it cover how to avoid going store to store? can you do the whole think online? Online Arbitrage (the book and/or the overall strategy) has nothing to do with going to stores. A great job writing the review on Online Arbitrage. To be honest I haven’t purchased the “Book” yet, and this is a part of why I am leaving the Comment. Chris Green is a real good guy, very informative, very giving, and most likely in January I’ll purchase this, yet this is more of “Online Arbitrage COURSE” and not just a ‘book’. Maybe if it was labeled and marketed this way I think people would feel much better about it, the idea of purchasing a Book for $200 is a turn-off. It is a Course, Facebook Group, Book, Spreecast, Videos, BOLO Team, Twitter, etc… If a online Seller wants to focus online 75% of their Inventory, then I would say this is a good Investment, especially over the next 5 years of selling. Next post: Confused about Amazon Best Sellers Rank? This will help.